Highly mobile hospital workers experiment intense and ad-hoc collaboration during their everyday practices. This has motivated the introduction of collaborative applications enhanced with ubiquitous technology in hospitals. However, an environment filled with many different systems augmented with a wide range of functionality, introduces an extra burden for hospital workers in selecting the services and information that are adequate to the task at a hand. Activity-Based Computing (ABC) has emerged as a new interaction paradigm in support of these problems. In this paper, we empower the vision of ABC with a degree of consciousness about the physical changing context towards the design of activity-aware applications. 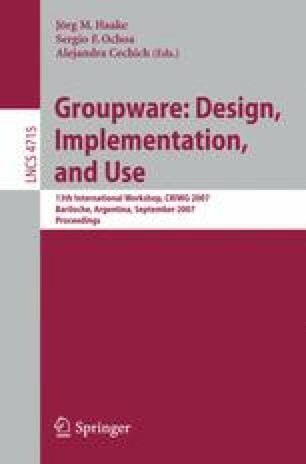 Based on workplace studies conducted in a hospital, we established a set of design principles for the development of activity-aware applications. To exemplify the design principles proposed, we designed and implemented an activity-aware map that personalizes the information shown to hospital workers, enforces availability and sends collaboration warnings.